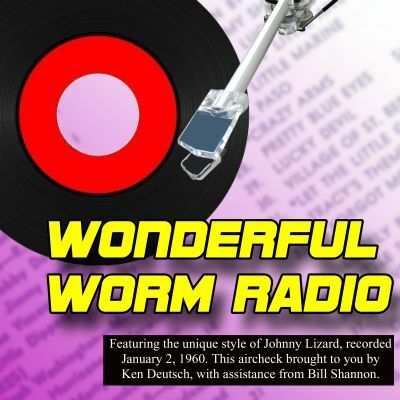 Ken writes: "Wonderful WORM Radio" was a top-40 parody I put together and originally included on CD with one of my books, "Up and Down the Dial." Since that book is no longer available in paperback, I wanted to make this goofy audio track available to everyone. Credit where credit is due: Some of the voices belong to the talented Bill Shannon. One of my jingle singers, Amy Leacock, plays 'Isabelle Ringing,' who is heard calling into the hitline. The role of Johnny Lizard was played by yours truly. Now you know why I never made it as a DJ! This top-40 parody featuring the fictitious DJ "Johnny Lizard" is not to be confused with any creative work produced by Ken Levine, a Hollywood writer and jingle fan. Ken Levine occasionally used the name "Johnny Lizard" when he was in college, a fact of which Ken Deutsch was unaware, and Mr. Levine just wants to ensure that people understand that Wonderful WORM is not connected with him in any way. Johnny Lizard and all of us at Wonderful WORM invite you to join our friend Radio Dave on the "Rare & Scratchy Rock 'N Roll" podcast series available at iTunes, TuneIn, Libsyn, and Stitcher. Visit www.rareandscratchy.com for complete information.